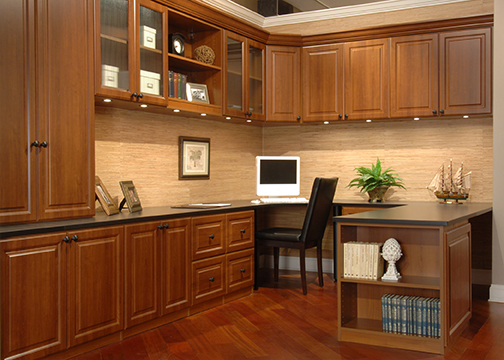 Offices and libraries can quickly go from being a luxury to being an essential part of your household. McCloset can turn your office from just another computer room into something that's really special. We can design a beautiful space for all your books, documents, and more. It can be a space that really showcases your style. McCloset has the ability to build very custom to semi-custom office cabinets to maximize your office's space and convenience. Working from home has never felt or looked so good in a beautiful home office made for your lifestyle. Whether you’re operating your business from the comforts of home or you’re simply paying the bills and doing some online shopping, do so in a home office that is as unique as you are. Whether a small area of another room or a large full service office, there are endless ways to maximize the storage and usage of your space. It can also be the technology hub of the household. There are many ways to implement high speed convenience within the office, such as a charging drawer, letting you say “goodbye” charging items all over the house. 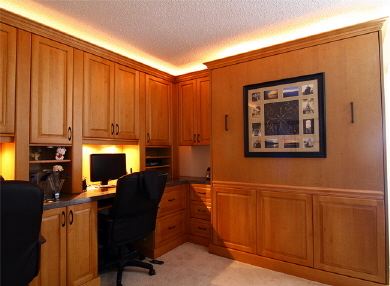 There are countless design features to add to your home office to make it personal to you and your lifestyle. After deciding on the size and functionality of your home office, it is time for the designer to work their magic creating a beautiful space to work in. Our excellent team of designers will ensure that your work space is a place of beauty and efficiency. There are many decisions to make when designing your office space, but with the help of one of McCloset's award winning designers, you will be able to narrow down all of the options.